I’ve just come back from a rather lovely family holiday in sun-kissed climes. Now, I realise that the fact I’ve just enjoyed a week soaking up a few rays in Spain is of little relevance to the good people of Doncaster – indeed, there's probably plenty of you out there frothing over your keyboards and getting ready to sharpen the axes as you read this. Darren Burke - a big fan of Doncaster's Robin Hood Airport. “Who cares?,” I hear some of you cry. “Why is he boasting about going on a foreign holiday?” I can just imagine some of you saying. 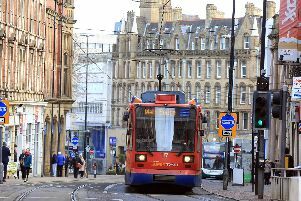 READ MORE: Don Your Way: Isn’t it time we let trams replace the train strain? Don’t worry, I’m not about to dig out the holiday snaps and bore you with how hot it was on the Costa or anything like that. The reason I’m telling you this is that my break was topped and tailed with flights out and in to Doncaster’s Robin Hood Airport. And that’s a facility of which the town can be justifiably proud. I’m expecting all the usual comments about it being ‘too expensive’ and other airports being ‘cheaper’ but for sheer convenience and ease of travel, have you ever experienced a smoother and more satisfying start and end to your holiday than using Doncaster’s airport? There's no better feeling when getting up in the middle of the night knowing that you’ll be sat in the departure lounge half an hour after locking your front door. Forget lengthy trips up and down the motorways, get your case off the carousel and you can be back home with your feet up and a cuppa in hand before the last passenger has got off the plane. Yes, we all know its a small airport with only a handful of flights each day but what do you want - Heathrow? I’d much rather whizz up a single escalator than trawl across half of London on those moving travelator things, crossing continents and time zones to reach a gate that’s about three miles away. There's not many towns of our size with a major international airport – and let’s be honest, doesn’t it give you a little bit of home town pride when you see the name ‘DONCASTER’ bearing down on you on those scrolling departure boards in some foreign clime? OK, its never going to link our town with all corners of the globe and its stock in trade might well be jets to the Spanish holiday resorts and Eastern Europe but each year, new and exciting places get added to the line-up – and that can only be a good thing, not just locally but for bringing in tourists from around the world too. Doncaster Sheffield, Robin Hood, Finningley, call it what you will, having a successful airport in Doncaster is something of which we should be immensely proud and supportive of. Oh, and I had a fab holiday, thanks.